"First of all a man then a true sportsman and a consummate archer-hunter, is perhaps the best possible definition of Art Young." Leonard K. Osberg penned this simple but powerful statement sometime in the early 1930's. Art Young might well have been the last great American Hero as Osberg implies, "With a courage that is magnificent and with ability known only to himself, Art Young has gone into the wildest frontiers of the world accomplishing with the bow and arrow that which no other figure in history is known to have done." 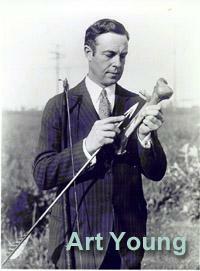 Arthur H. Young was born August 17, 1883 in Kelseyville, California, the fourth of five children. His father, William Gaylord Young, was a school teacher, businessman and Union Army veteran who had moved west in 1881 and settled in Kelseyville. Young was attending a San Francisco High School when the death of his father required his return home to help run the family business. The area around Kelseyville abounded with wildlife and Art, along with his brothers and friends spent much time camping, hunting and fishing. He quickly mastered the rifle and pistol, eventually competing in matches for the Olympic Club of San Francisco. It was during these early years that he learned to play the violin and developed the habit of carrying an abbreviated version of the instrument on his outings and camping trips. Art became interested in swimming and excelled in the 220, 440 and 880 yard events, winning the Western Championship twice. Reportedly, he never was beat in any of his matches and was training for the Olympics when circumstances forced his withdrawal. With the family business in order Art moved back to San Francisco and took employment with the San Francisco Call newspaper. He would remain with the newspaper for 14 years. Will Compton is the person responsible for teaching Young the art of archery and introducing him to Dr. Saxton Pope and Ishi. According to Cassius Styles, Art Young was the best shot of the group, "He was one of the very few men I have seen who was really master of an 80 pound hunting bow. This was not because he was gifted with enormous strength; he commanded that bow because he was not too lazy to practice with simple persistence. He was a violinist with enough real talent to give finished recitals with the same hand that gripped his heavy shooting gear. His shooting was as artistic as a recital, and almost as thrilling." Both Young and Dr. Pope began making bows from Pacific yew and both carried bows of yew in Wyoming on their hunt for grizzlies. Of the six grizzlies taken, only one required a finishing rifle shot and Young's huge grizzly was taken with a single well placed arrow. Young was an accomplished writer and it is a shame he never published a book chronicling his adventures and experiences. But, not all is lost as Young did write and publish some excellent articles. The article "Killing Power of the Feathered Shaft" by Young in the March 1935 Sports Afield provides his view on many of their great adventures. Dr. Pope would continue to use Pacific yew as his wood of choice, but sometime in the early 1920's Young began experimenting with osage orange. He obtained his osage from E.F. Pope [no relation to Dr. Pope], a well known dealer of quality osage billets and staves in Woodville, Texas. For a detailed look at these bows, check out Joe St. Charles' article, "Art Young's Bows" in the June/July 1995 issue of Traditional Bowhunter. In 1922 and 1923 Young traveled to Alaska accompanied by cameraman Jack Robertson. Neither carried a firearm, relying solely upon Young's osage longbow for protection. Young took mountain sheep, mountain goat, moose and an Alaskan brown bear on Kodiak Island. Many of these hunts were captured on film and later released under the title Alaskan Adventure. Who will ever forget that riveting view of Art as "he stood in the high grass of that Alaskan meadow near the salmon riffles, with four great Kadiaks just about to play croquet with him, and only his strung bow with which to protect himself and the camera man. Even as he shot, one of them, a female, started to charge from his right. Very fortunately it changed its mind when it saw Arthur's arrow lay low its enormous comrade, and veered off to disappear in the brush. If this sow grizzly hadn't veered off we never would have seen the movie of this item of unbelievable coolness and skill." Dr. Pope included a chapter on Young's Alaskan adventures in the second edition of Hunting with the Bow & Arrow published in 1925. According to Young, ever since taking up the hunting of game with bow and arrow, he had to contend with more than his share of skeptics when it came to the efficiency of the longbow. "At first we archers hunted squirrels and rabbits, and the doubters told us we could not kill deer. We killed deer, and they raised the ante to bear. Right straight through the list we went until we had killed every species of American game fairly, including the grizzly bear of our Rockies and the brown grizzly of Alaska." The question of taking on an African lion with the longbow was brought up in California in 1924 as Art Young, Saxton Pope and Stewart Edward White were enjoying a roving shoot. I guess the answer was "Why not?" because on March 6, 1925, the trio sailed from New York for Mombasa, Africa. They arrived one month later and the Safari that would spawn two books and a series of articles in Field and Stream began in earnest. It quickly became evident that the longbow was not the ideal weapon for dispatching lions at close quarters, but given the proper conditions, the lethal qualities of a sharp broadhead in the boiler room were more than adequate. A total of seven lions were taken with the longbow along with a number that had to be dispatched with a rifle. The highlight of the Safari was Young taking a huge male lion from an old rotten, thorn boma at night. The lion was lured into a bait and both Young and Dr. Pope loosed arrows at it from a distance of less than 12 yards with only Young's finding its mark. The following is Young's version of this great moment. "We slowly and quietly strung our bows and placed our arrows on the strings. We pulled our bows until the arrows were fully drawn and the steel touched our left hands. At a given signal the arrows flashed out at the lion. Wowie! and again I say wowie! You should have seen the action! Man! Man! How that old maned boy landed on his feet and faced us all in one motion and at the same time let out a blood- curdling roar. It fairly shook things. He quickly looked about for something to charge. We stood still. Seeing nothing to charge, he broke into a run and fell seventy-nine paces away. He immediately regained his feet, squared around ready for business, then pitched forward dead. We calculated he lived less than ten seconds after having been hit with the arrow." In 1926 Young embarked on an expedition to Greenland with young George P. Putnam on the Morrissey, captained by Bob Bartlett. It was on this voyage, well documented by young Putnam in his book David Goes To Greenland (1926), that Young takes both walrus and polar bear. These animals were taken while swimming, a fact that does nothing to diminish the accomplishments of Young during this expedition. After reading Young's rendition of the episode with the walrus, little doubt should remain as to the fairness of challenging a walrus from a small skiff with bow and arrow. "Savagely the walrus clinched the bow of our boat between his front flippers and with a decided snap of his head plunged those tusks through the side of the boat not very far from my shins. He quickly jerked his weapons out of the ragged holes and like a flash swung his head and tusks in a most dexterous manner to the right and crashed the two long ivories through the other side of the launch. I grabbed the lance and made a jab at the raging beast, but, as luck would have it, the cutting blade was on the other end of the handle. Not wishing to risk turning the lance around after having seen how fast the wrecker could work, I used all my strength to keep the weakening, fighting monster away from our craft." With little else to accomplish in the manner of taking game with the longbow, Young settled into a routine of lecturing and working with the youth of America. Sometime in the early thirties he moved to Homewood, Illinois where he worked at the 1934 World's Fair in Chicago as well as continuing his lectures. In February, 1935, Young contacted his friend Paul Klopsteg who also resided in the Homewood area and invited him over to meet Sasha Siemel. Klopsteg was one of two outsiders invited to hear Young and Siemel give their lecture demonstrations that evening. Klopsteg had the instinct to bring along his copy of Elmer's Archery and had both autograph it at the completion of that memorable occasion. Three weeks later Art Young was admitted to the hospital with a ruptured appendix and died from complications of peritonitis, early on a Tuesday morning, February 26, 1935.